Interested in creating a drip campaign or nurture series, but not sure where to start? Depending on your business goals, there are endless ways an email drip campaign can add value as one of your marketing strategies. You may be looking to help new customers onboard to your product, drive attendance to an upcoming event, or encourage contacts to upgrade from a free version. 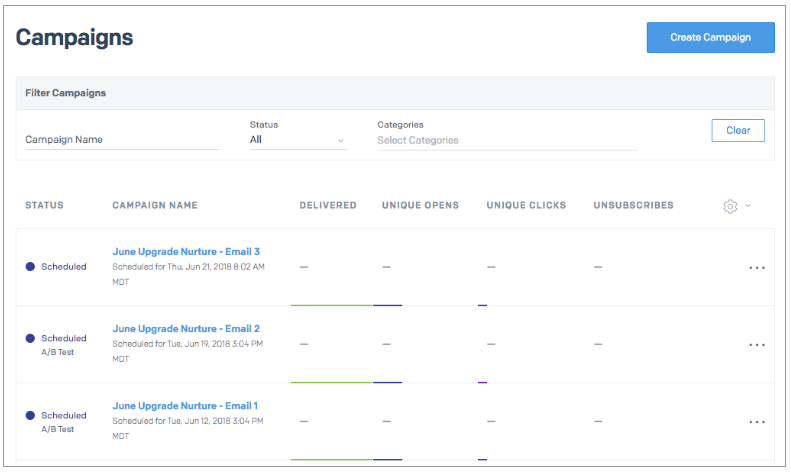 Creating a drip series using SendGrid Marketing Campaigns is as simple as identifying the flow of emails you want to send, who to send to, and at what cadence. This post will show how you can build a nurture series in Marketing Campaigns today. We’ll walk through how to create a drip campaign to drive upgrades, but the workflow will be similar for any type of nurture series you’re using as part of your marketing strategy. To get started, we’ll outline our strategy by deciding: what emails we want to send, who to send to, and at what cadence. With our drip campaign strategy outlined, we’re ready to dive into building the series in Marketing Campaigns. Step 1: Create a segment of contacts on the free plan. For this series, we’ll use custom fields to import data into Marketing Campaigns about what plan our contacts are on. Tip: In this example we’ve also added criteria to ensure contacts in this segment have opened an email in the last 120 days. Sending to engaged recipients is always a great way to protect our reputation and deliverability. Want to learn more about maintaining an engaged email list? Check out How to Create and Implement a Sunset Policy. Step 2: Craft campaign content. Using the flexible campaign editing tools in Marketing Campaigns, we’ll design each of the emails to deliver on the main message for each. For the internal-facing Campaign Name (found under Settings), we’ll use a common naming convention across each email in our series: “June Upgrade Nurture – Email 1,” “June Upgrade Nurture – Email 2,” etc. Once each email is complete, we can see our scheduled drip campaign on the Campaigns summary page. 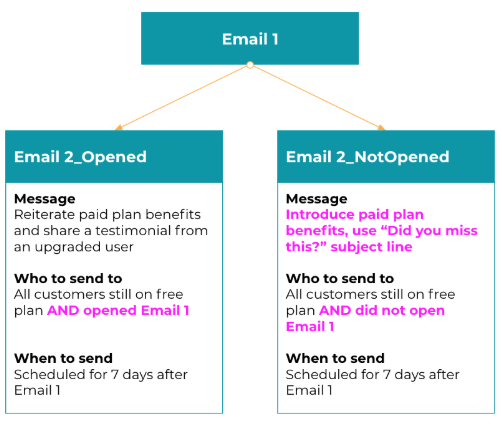 To create an even more tailored experience, we can set our drip series up to automatically branch based on whether contacts have opened the preceding email or not. Email drip campaigns are a great way to craft a cohesive experience for your recipients and support your marketing strategies. Using Marketing Campaigns segmentation and scheduling tools, you can save time by automating your recipient selection and sending according to the parameters you’ve chosen in advance. Log into your account to create your first series today! 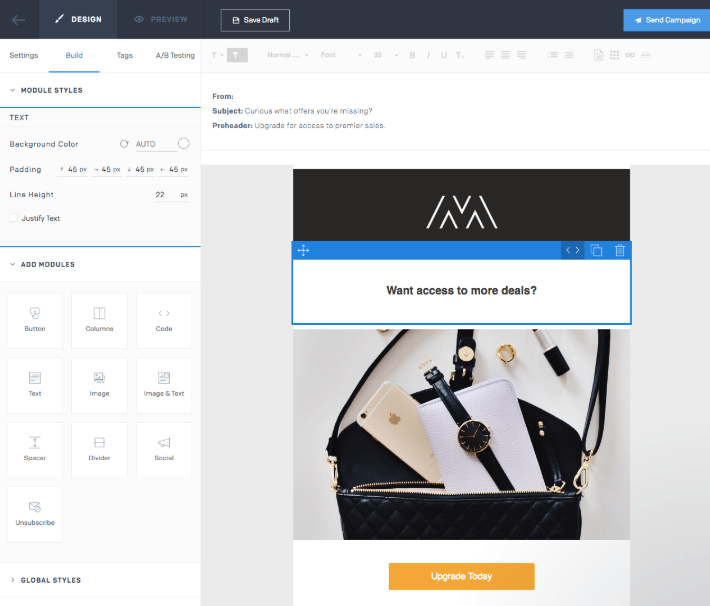 If you’re interested in learning about SendGrid’s new email automation product, sign up to be put on our early access email automation beta. Molly Friederich is a part of the Product Marketing Team at SendGrid. As a passionate customer advocate, her goal is to help understand and represent the user voice across everything SendGrid does.